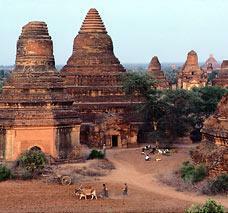 The earliest records of the type now known as Burmese come from Thiland, then known as Siam. A series of 17 illustrated poems written in Siam during the period of the Ayudhya mention three types of cat which appear to correspond to known breeds. These were the Vichien Mat ( Siamese), the Si-Sawat ( Korat), and the Thong Daeng ( Copper, now known as Burmese). These cats are thought to have remained in Thailand until it was invaded by the Burmese in the 18th century; returning solders may have taken the temple cats with them back to Burma. In 1871, Harrison Weir organized a cat show at the Crystal Palace. A pair of Siamese cats were on display that closely resembled modern American Burmese cats in build, although Siamese in marking. After this, cat fancy began with cat clubs and cat shows forming, although it took many years for breeds to be worked-out and developed. The first Burmese cats in the late 19th century in Britain were considered Chocolate Siamese rather than a breed in their own right, and this view persisted for many years, encouraging cross-breeding between Burmese and Siamese and attempts to breed Burmese to more closely conform with the Siamese build. The breed slowly died out in Britain. Dr. Joseph Cressman Thompson imported Wong Mau, a brown female cat, into San Francisco in 1930. As had happened earlier, many breeders considered the cat simply to be a color variant of the Siamese, but Dr Thompson considered the build sufficiently different to be something else. Without any male of a similar type, Wong Mau was bred with Tai Mei, a seal point Siamese from Thailand. 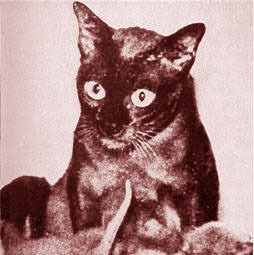 Wong Mau was then bred with her son to produce dark brown kittens that were called Burmese cats. In 1936, the Cat Fancier's Association granted recognition to the Burmese breed, but withdrew this in 1947 owing to the breed being mixed with Siamese and hybrid kittens being sold as pure. By 1953 the Burmese Cat Society of America had brought the situation under enough control for recognition to be restored. The breed didn't take off in Britain until after 1945, when soldiers returning from Burma brought home cats. 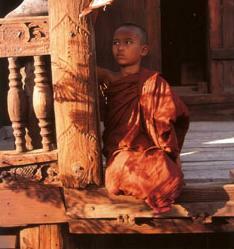 From about 1949 to 1956, the British Burmese population was being enriched with cats imported from America. The cats which fed the British breeding program were of a variety of builds. By 1952, three generations had been produced in Britain and official recognition was granted by the Governing Council of the Cat Fancy and the breed was accorded the breed number 27. Until the late 1960s, the gene pool in Britain was very small, with most Burmese being descended from 6 initial imports and a Burmese/Chinese hybrid from Singapore. In 1969, more were brought over from Canada, and the gene pool was widened. The first blue Burmese was born in 1955 in England. This was to be followed by red, cream and tortoiseshell kittens over the next couple of decades. Much effort was put in to remove banding patterns from the coats, and to decide whether these new colors counted as Burmese. Champagne colored cats (known as 'chocolate' in the UK) appeared in America, but breeding was impeded by the refusal of breed clubs to acknowledge that Burmese cats could be any color other than Brown. In 1971, the first lilac kitten was born, being the latest solid color introduced in Burmese. Throughout the 1970s, brown, chocolate (champagne), blue and lilac tortoiseshell types were developed in England. From the 1950s onwards, countries in the Commonwealth and Europe started importing Burmese cats from Britain. As a result, most countries based their Standard of Points for this breed on the British model, rather than the American. 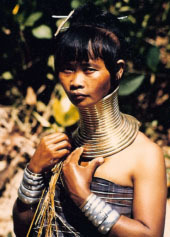 As a result of these separate breeding programs, British Burmese are different to American Burmese. The British build tends to be more Oriental, with a more triangular face, while the American Burmese is stockier and rounder in the body, head, eyes and feet.